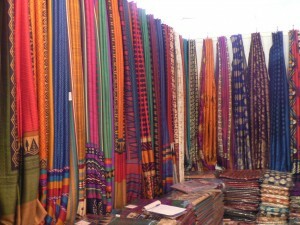 Assam silk is one of the hottest souvenirs to take home. Choose from Endi, Muga, and Pat varieties. 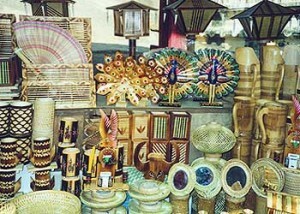 Bamboo and cane are used to produce a wide range of furniture, handicrafts and decorative items. The main shopping centre is Fancy Bazar, Paltan Bazar, and Pan Bazar. 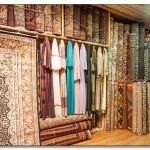 Most emporia are located in Fancy Bazaar and Pan Bazaar area. Roadside evening markets in these areas sell handicrafts. Foremost amongst the traditional crafts of Assam are hand-made toys, made from clay, cork (pith), wood and bamboo and an admixture of cloth and mud. While the birde and groom are common subject, in the clay-toy making segment animals dominate. The Kumar and Hira potter communities traditionally make Clay toys. 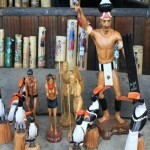 Deities and mythological figures are also important themes in the toy-making repertoire. Assam is reputed for its silk and the most prominent variety is muga, the golden silk exclusive only to this state. Apart from muga there is path, as also eri, the latter being used in the manufacture of warm clothes for winter. Purbashree run by the North-Eastern Handicrafts and Handloom Development Corporation, stocks silks, laichampi (quilt-like material) and handicrafts from Assam, honey (Meghalaya) wool carpets (Arunachal Pradesh), Kuki shawls (Manipur), cane and bamboo work (Tripura), shawls (Nagaland) and caps (Mizoram). Pragjyotika (Assam emporium) is popular for Handloom & Handicrafts. Assam Apex Weavers & Artisans Cooperative Federation sells Assam silks, textiles, bamboo, and handicrafts. Khadi Gramodyog Bhavan sells Khadi material, readymade leather goods and handmade paper. This entry was posted in Assam, Shopping, Shopping In Assam and tagged assam attractions, Shopping, shopping in assam. Bookmark the permalink.